What we now know as John F. Kennedy International Airport was constructed as Idlewild Airport in 1942 on top of the Idlewild golf course in Queens. The project was undertaken to relieve LaGuardia Airport (built in 1939) of some of its traffic, as it quickly became too crowded. The original plans called for a modest 1,000 acre airport, but by the time construction was finished, the airport had grown to 4,930 acres with over thirty miles of roadway. Commercial flights began in July 1948. In 1943, the airport was actually renamed Major General Alexander E. Anderson Airport after the Queens resident who had commanded the Federalized National Guard and died in 1942. In 1948, the City Council renamed it New York International Airport, Anderson Field, but people continued to call it Idlewild. Here’s a few of the photos courtesy of LIFE, check out the remainder by jumping over to their post here. PS – That top picture is the Robert Sowers designed stained glass mural commissioned by American Airline’s in the early 1960s for Terminal 8. 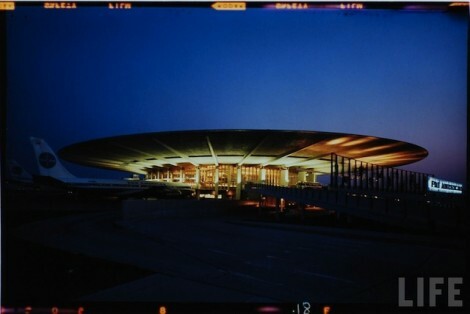 When AA opened their new JFK T8, unfortunately the stained glass mural was demolished. A portion of the mural was shipped to Dallas and is now installed at the C. R. Smith Museum at the American Airlines training center in Fort Worth. Related – See Field Trip to the TWA Flight Center – Behind the Scene Pics and a Journey Back in Time – Lots of Photos! A New Location for Vanilla Reloads! New Yorkers Rejoice!